Are you looking for information about how to treat thyroid cancer? Then first let’s look at brief information about Thyroid cancer. Malignant cancer cells that form in the tissues of the thyroid gland might develop into thyroid cancer. This cancer generally occurs in follicular or parafollicular thyroid cells. Exposure to excessive ionizing radiation and genetic factors are the main causes of thyroid cancer. The symptoms of this type of cancer include lump or swelling in the neck. 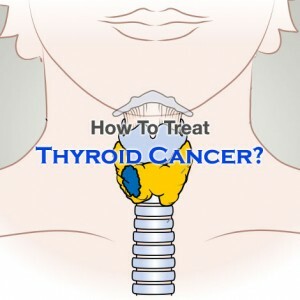 There are different tests examining the neck, blood and the thyroid, used for diagnosing and detecting thyroid cancer. There are different factors that affect the chances of recovery and treatment options for this type of cancer. Thyroidectomy surgery comes as one of the most effective treatments for thyroid cancer. For the people who are apprehensive about the best cure for this condition and wonder How to Treat Thyroid Cancer, surgery stands as the most effective treatment. Surgery involves the removal of whole thyroid gland or a part according to the spread of cancer. But, after undergoing this surgery, body won’t be able to produce needed thyroid hormone anymore. The thyroid glands generally absorb all the iodine present in the human body. Radioactive iodine therapy can help in destroying the thyroid gland and other thyroid cells taking up iodine with very little effect on the human body. Taking thyroid hormone pills on a regular basis can help in maintaining the normal metabolism of the body after having thyroidectomy surgery and helps in stopping the remaining cancerous cells from developing. Thyroid hormone therapy also prevents the thyroid cancers from appearing all over again. This is a kind of radiation therapy where high-energy x-rays are delivered through a machine from outside the human body for destroying the cancer cells. This generally consists of a number of different treatments provided over a specific span of time. When looking for how to treat thyroid cancer, a person can also opt for Chemotherapy, which is also one of the effective thyroid cancer treatment options available. In this therapy, anti-cancer drugs are given to the patient either through mouth or injected to vein or muscle.